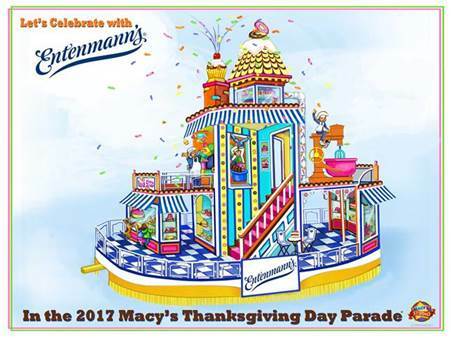 This Thanksgiving, JLG client Entenmann’s will unveil a new confection-inspired float created especially for the annual Macy’s Thanksgiving Day Parade. This marks the brand’s first time participating in this iconic holiday event that is watched by more than than 3.5 million spectators in New York City and over 50 million television viewers across the country. The partnership highlights Entenmann’s heritage, since the brand was founded in New York City. Both the Macy’s and Entenmann’s brands are committed to family fun and tradition. The new float is inspired by Entenmann’s signature treats and will feature a colorful bakery showcasing the spirit of the brand through bursting confetti, rotating donuts and displays of delicious desserts. As part of this exciting brand extension, Entenmann’s is also hosting a Facebook contest in which two lucky winners will be selected to win a trip to the parade. Each winner will receive a three day, four night stay in New York City, along with four grandstand tickets to the parade and a year’s supply of Entenmann’s treats. The 91st Annual Macy’s Thanksgiving Day Parade will air nationwide on NBC-TV, on Thursday, Nov. 23, 2017 from 9 a.m. to noon in all time zones.